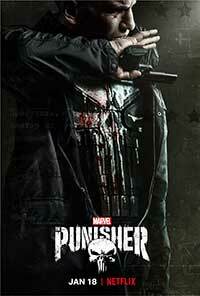 In Season 1 of The Punisher, this ultra-dark Netflix Original Marvel series pitted Frank Castle, AKA “The Punisher,” (Jon Bernthal) against his former special forces buddy Billy Russo (Ben Barnes). Castle is still seeking to avenge the murder of his family by members of a narcotics ring. As Season 2 opens, Russo is in the hospital recovering from a savage beating administered by Castle who is now on the run from a slew of folks that wants him dead. This new season’s wildcard is John Pilgrim (Josh Stewart), a former vicious gang member and recovered drug addict, who wreaks his religious vengeance on those whom he considers evildoers beginning with Russian gang boss Sergei Konchevsky (Alexander Notkin). Pilgrim’s wife Rebecca (Allie McCullough) has a debilitating illness, but, fortunately, wealthy Anderson Schultz (Corbin Bernsen) and his wife Eliza (Annette O’Toole) have been the Pilgrim family’s long-term benefactors. Schultz intends for Pilgrim to go to NYC, place a bounty on Castle’s head, and have him taken out. Meanwhile, Frank has hooked up with Amy Bendix AKA “Rachel” (Giorgia Whigham) who is being pursued by Russian oligarch Nikolai Polosnev (Dikran Tulaine) now living in New York. Frank confronts Polosnev about Schultz’s son David (Todd Alan Crain), a US Senator being groomed for a Presidential run. The inconvenient truth, backed up by candid photos taken by Russian gangsters, is that David is gay, a fact that Castle would be more than happy to exploit. Billy regains consciousness and breaks out of the hospital aided by lonely psychiatrist Dr. Krista Dumont (Floriana Lima). Krista lets the scar-faced psycho stay in her apartment while their relationship gradually heats up. FBI Agent Dinah Madani (Amber Rose Revah) has been looking in on Billy on a daily basis until his escape and is now committed to tracking him down. Frank and ex-Navy buddy Curtis Hoyle (Jason R. Moore) form a two-man force to take down Russo who has recruited ex-servicemen to form his personal fighting force. With a seriously wounded Pilgrim still on the loose, an ultimate showdown looms ahead as it looks like only one of these three tough guys might be still standing when the last drop of blood has been spilled and the final life taken. The Punisher probes its characters more deeply than most of the Marvel Netflix fare. Many of the dark themes that drive the other shows are reproduced here but with a hero gifted with remarkable recuperative powers and not superhuman powers. Jon Bernthal puts a literal and often bloodied face on an “everyman” character who, in his unconventional way, fights for “truth, justice, and the American way.” His supporting cast, many of whom have been carried over from Season One are simply terrific. This show’s creator Steve Lightfoot has spun another exciting yarn that will keep the television audience on edge for thirteen new episodes. Season Two continues the panoply of graphic violence that punctuated its predecessor, and this may be off-putting to those with weak constitutions. That reservation aside, this show continues its exciting journey through the underworld of organized crime and vigilante justice. Highly recommended. 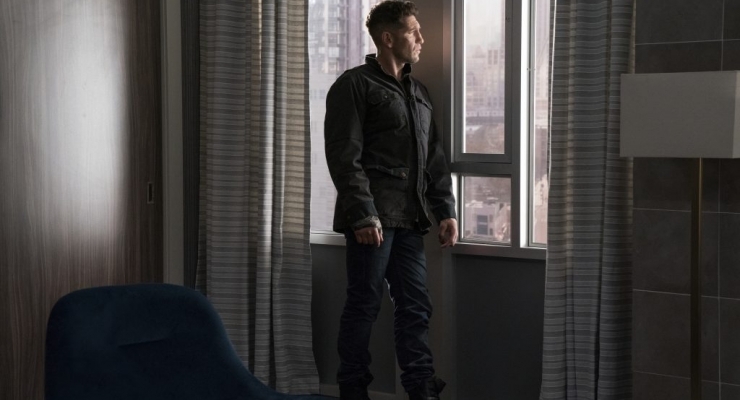 The Punisher Season 2 packs even more excitement than its predecessor as Jon Bernthal reprises his amazing ability to absorb punishment and dish out even more than he receives. A strong supporting cast returns for thirteen episodes of unabashed graphic violence which is exactly what The Punisher fans expect.